Continuing Elvis: The Autopilot Years. This is confidence pressed into the service of competence; no ‘luck’ required. Is this the most minimal review on Popular? Ha! It does deserve a little more comment… The day after Elvis died Simon Bates’ Golden Hour was unsurprisingly dedicated to him. Once I’d woken up and realised what was happening I recorded as much of the show as I could. I played the tape incessantly over the next few months until I saved up for the 40 Greatest comp (on pink vinyl!). Good Luck Charm came between His Latest Flame and Viva Las Vegas on the tape, and I could never warm to it; it always sounded like he was half asleep. Listening to it now, the uh-huh-huh’s are an embarrassing self-parody. Looking at pictures of Elvis from 1962 he looks puffy-eyed, puffy-faced (and puffy-bodied in Kid Galahad). Clearly, he’d begun to lose the will to fight the Colonel and Hollywood, and to stand up for himself; he didn’t even care about his appearance. He’d been a lot more engaged just a year earlier – whatever you make of his number ones from that year (Now Or Never, Are You Lonesome, Surrender, not inc. the UK only Wooden Heart) you can tell they were largely his choices. 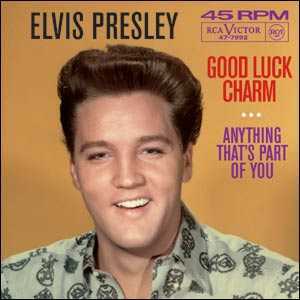 Although not a hopeless song – typical 1962 Nashville that Brenda Lee could have spiced up nicely – Good Luck Charm is the first truly careless Elvis 45. Elvis approached a remarkably similar lyric on I Got Lucky, also in 1962, with considerably more spark and a gorgeous, believably carefree lightness on the higher notes. It was a single in Europe and would have made a good substitute for this snoozer in the UK. This song marked the end of an era for Elvis, and is therefore with hindsight entirely appropriate as Elvis falls asleep like Rip van Winkle, his regular and reliable songwriters desert him following some dispute with the Colonel, and the Beatles turn up. This was his last number one in the US for several years although his ever faithful British fans continued to send him to the top. This song sounds to me as if Elvis was auditioning for the Jordanaires (now there’s a thought – The Jordanaires ft. Elvis Presley – it makes this song sound so much better). This always sounded to me like a laidback, relaxed Elvis kicking out a familiar tune with a bunch of friends, a cig and a drink poured for later. So, I can’t dislike it. He’d earned it by now. Marquess of Bath, Owner of Longleat(1975). while this doesn’t sound the most heartfelt performance of Elvis career there’s a warmth and commitment that I find endearing. The vocal harmonies and musical backing are precise but not coldly clinical. It’s a goofy piece of fun that thankfully doesn’t outstay its welcome. Probably the Elvis song I most often forget actually reached #1, both here in the US and the UK. There are at least a dozen better songs sitting around at the the time that would have made a better single.